I had been looking for a TV stand for my apartment. I was using a bookshelf that was at an awkward height and was (still is!) on its last leg of life. I searched for one everywhere I went - Target, Ikea, Marshalls.....but they were all SO expensive. Okay, they weren't that expensive, but I am cheap. Everything that I liked was out of my price range and everything in my price range looked cheap. So I delayed and eventually stopped looking. They say that once stop looking, you will find what you had been looking for all along. Yes, usually this is in the context of a significant other (which side note - is false, but whatevs), but it really applied to me in this situation. I was shopping with my friend, Caitlin, at Deseret Industries (thrift store) for something totally unrelated to furniture. We ended up in the furniture department and I found this dresser. It appealed to me, but I wasn't convinced right away. It was $40, which at the time seemed more that what I was willing to spend (see - I told you I am cheap! ), but I bit the bullet and bought it anyway. Beautiful, right? I thought that it had great structure (it is solid wood - just ask the guys who brought it up to my second story apartment!) and I loved the legs. That is what sold me. Love. The. Legs. I planned to paint it (I didn't know what color yet when I bought it) and add new hardware. My first stop was Pinterest. I pinned and researched for weeks. How did we survive without the internet? I looked at different paint types, colors, knobs....I wanted to look at all of my options. If you know me at all, you know that options have a tendency to overwhelm me. If I am not familiar with a restaurant menu, it can take me forever to decide. I WILL be the last one to order - always! Surprisingly, I wasn't overwhelmed at all; I was excited and ready to get started. Getting started actually was the hardest part for me. I was busy - this summer was the summer of weddings so once that was all over, I was ready to begin. 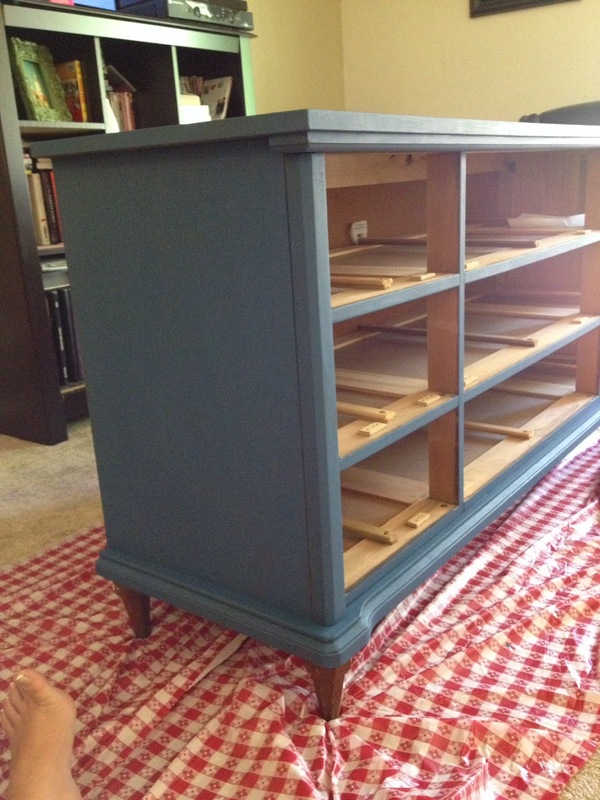 In my research, I decided to use Miss Mustard Seed milk paint. I loved how her paint looked and I fell in love with the color Flow Blue. I knew I wanted a darker blue and this color was perfect. 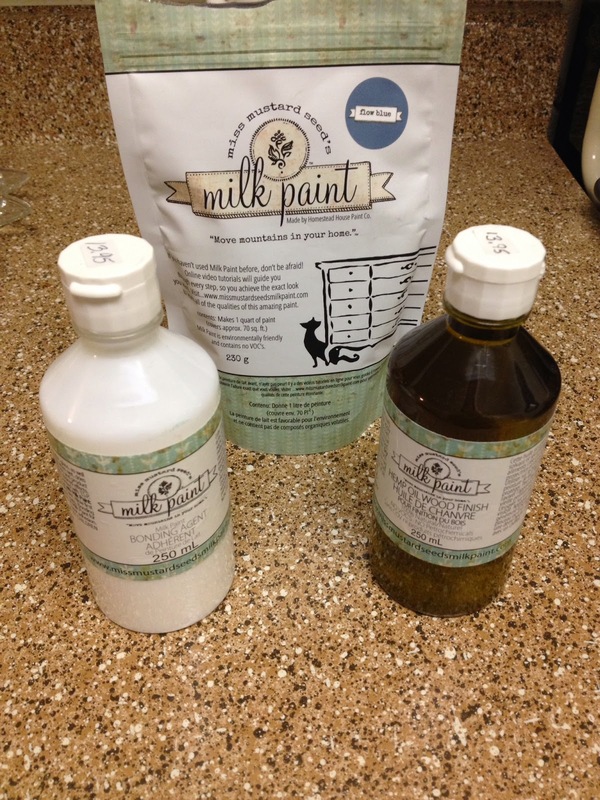 There is a local retailer in Fair Oaks so I was able to purchase the paint and talk about my options as well. I was also able to watch the many YouTube tutorials that the creator has on her website. Seriously, check the website out - SO many good ideas! 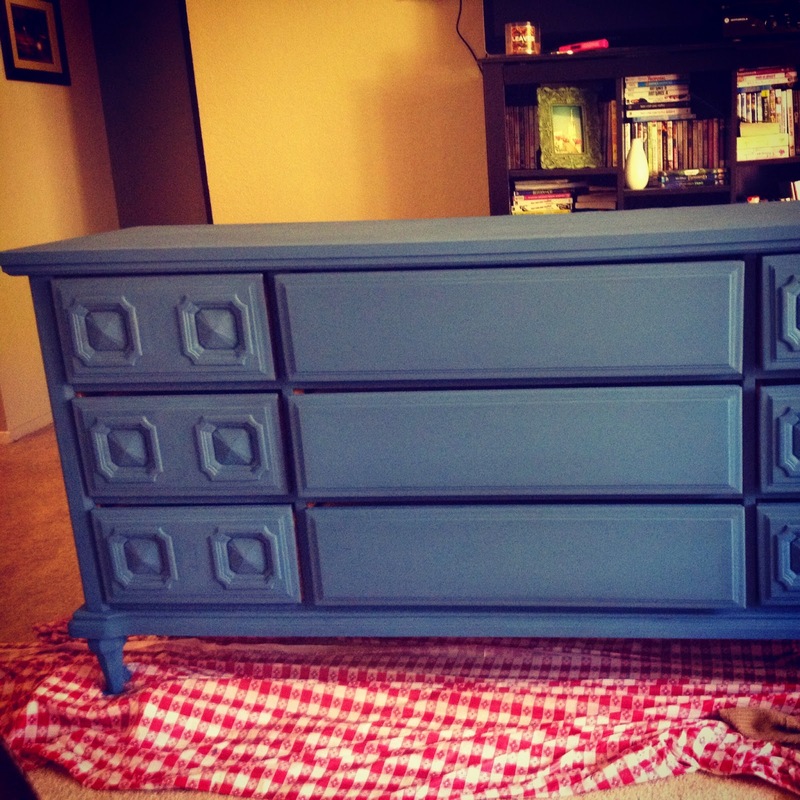 The thing with milk paint is it is really easy to achieve the distressed look easily. It will naturally flake off and distress (depending on your piece) unless you add their product called a bonding agent. I decided that I didn't want it to naturally distress (since this can be unpredictable and I didn't want unpredictable at all) so I decided to use the bonding agent. 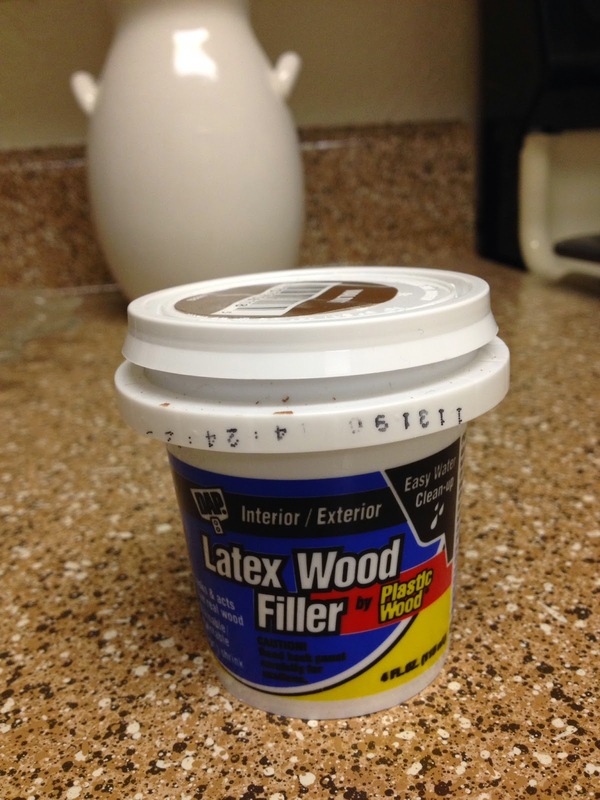 Plus with the added bonding agent, it required limited sanding (since it bonds well on even finished wood surfaces) so it was really easy to get started. Laziness - sells me every time! The paint doesn't come in liquid form, but in a powder substance that you mix with water. The main prep that I had to do was to clean the dresser (it was a mess!) and to fill in the holes from the previous hardware. The hardware that I purchased wouldn't fit in the existing holes so this was a must-do step. Once I started painting, it was just a matter of finishing. I painted the first coat before I went on a weekend cruise. Then once I got back I resumed painting. It took a few days since there was limited daylight after getting home from work. Once it was all painted, I let it dry for a couple of days. Honestly, this was the point where I started to doubt. Did I want to distress the piece? I knew that I used the bonding agent, but I could have sanded the edges to distress it in the areas that I wanted. I wasn't sure what I wanted to do. I went to Facebook to get opinions, but, in the end, I decided to leave it as it was. I am so glad that I did! Lastly, I applied the hemp oil finish and let it dry overnight. After that, I drilled the holes for the hardware. In the end, I am very happy with the result. It took so much longer than I intended/wanted, but I am glad that I didn't rush through it. I am so in love with the finished product. Everything about this dresser is me. I love crazy huge accessories and so when I saw the flower knobs, I knew I had to have them. Unfortunately, these were the last two in the store (and even online) so I knew that I would have to get others for the other drawers. I found the pearl knobs on Etsy and fell in love with them instantly. I love pearls and wear them often so I felt that these knobs fit my personality. 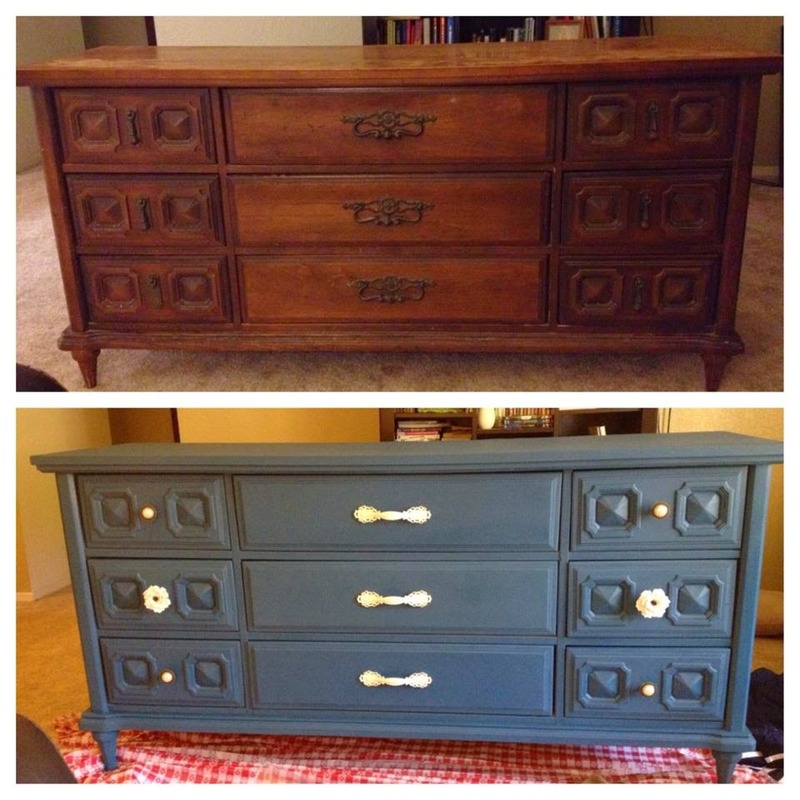 I found the middle drawer pulls off of Etsy as well and I knew they would tie everything together well. I recognize that this seems like a lot (mostly for the hardware), however, if I were to buy this dresser in its current state (from Pottery Barn, Etsy, or a smaller retailer) it would easily cost me between $500 and $1,500. My version is a bargain! Plus I was able to customize it to exactly what I wanted. I don't regret any part of this project. This is a piece that I will be proud to show off and keep in my home for many years to come.